Mr. Don Pierce (NIST) :: Team Leader, RFO Engineering. Leads team of 16 mechanical engineers and draftsmen (NIST, UDEL, and University of Maryland). Team responsibilities include the design and acquisition of neutron scattering instrumentation and neutron guide and shielding systems. Dr. Yun Liu (UDEL) :: Dr. Yun Liu is an instrument scientist for small angle neutron scattering. His research involves the use of neutron methods to study colloidal interactions and to develop new materials for energy storage. Mr. Steve Swern (UDEL) :: Mechanical Engineer, RFO Engineering. Steve is currently involved in the design of the neutron guide system for the five new neutron beamlines that will illuminate the new instrumentation in the NCNR guide hall addition that is currently under construction. Specifically, Steve is involved in the design of vacuum jackets that will contain neutron guides and the main beam shutters for controlling neutron current through the guides. Mr. Ilan Breit (UDEL) :: Mechanical Engineer, RFO Engineering. Ilan has been involved in the design of components for the NCNR Guide Characterization Lab that will facilitate the measurement of the new neutron guides. In addition, he has been involved in the design and detailing of the new guide shielding vessels. Currently he is designing a vacuum jacket assembly that will house the NCNR NG- B guides. Mr. Chirag Parikh (UDEL) :: Software Engineer, RFO. Chirag is a recent hire and is gearing up to make an impact on control software for the NCNR’s neutron spectrometers. Chirag is currently looking into improving communication between the Instrument control software’s client and server. Mr. Brett George (UDEL) :: Software Engineer, RFO. Brett is currently involved in writing and maintaining the control software for the NCNR’s neutron spectrometers. Though Brett has only been in his position for a short time he has already contributed to key optimizations that allow the instrumentation to recover from device errors and run without operator intervention when device failure occurs. Mr. Robert Shirley (NIST) :: Team Leader, RFO. Leads a team of four software engineers from NIST and UDEL. 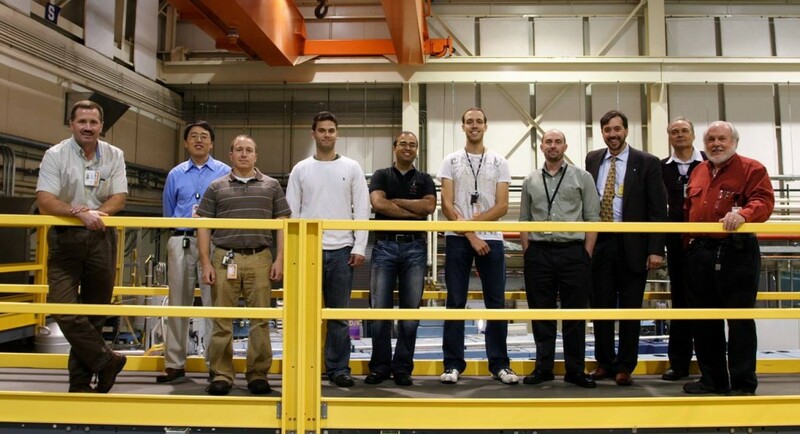 The team is responsible for writing the instrument control software for the facilities neutron spectrometers. Dr. Norman Wagner (UDEL) :: Director, Center for Neutron Science and Chair, Department of Chemical Engineering at the University of Delaware. Mr. Jeffrey Trossen (UDEL) :: Draftsman, RFO Engineering. Jeffrey is responsible for creating the manufacturing document packages for the acquisition of all custom hardware and equipment required for the NCNR expansion projects. Jeffrey works closely with the engineers translating the final 3-D design assemblies into machine shop ?ready drawings for part fabrication and assembly drawings for use here at the NCNR in building and testing component assemblies. Mr. Jim LaRock (UDEL) :: Mechanical Engineer, RFO Engineering. Jim is largely responsible for a recent upgrade to the NCNR crane systems and is a key reviewer on the crane design to be deployed in the new guide hall. Jim handles crane inspections and maintenance for the many cranes that are in use at the NCNR. Cranes are a vital part of the infrastructure at the NCNR for adding new capabilities (guides, shielding, instrumentation) as well as everyday operation of the NCNR user program (loading and unloading sample environment equipment). Not pictured – Dr. Charles Glinka (UDEL) :: Instrument Scientist working on the VSANS instrumentation, one of the American Competitiveness Initiative Expansion instruments part of the NCNR NIST expansion project.